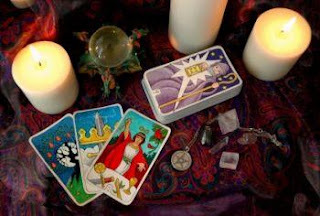 The practice of tarot is many centuries old. It was played in french parlors and all across Europe as a card game, and it became a tool of prophecy in the 1600's. Although the most widely used set is the"Rider-Waite" deck, the interpretations of the deck are as widely varied as the amount of decks available. The possibility that three random cards will tell your past, present, and future is intimidating at the least but probably not true. And still, some people refuse to ever have their cards read. It freaks them out (respectively) but there is no science behind it. Everyone has heard the term, "knock on wood!" to keep your good luck. But where and why did it come about? To start, no one can really trace back the one true origin. There are believe origins for Christians, Jewish people, pagan groups. It is said that many pagan groups that worshipped trees. The Ancient Celts thought that spirits and gods lived inside the trees. One origin belief is that people would knock on the wood of their houses to scare away evil spirits that could possibly ruin the good luck that the people were discussing. A second idea is that people would put their hands on trees to ask for good luck from the spirits living inside or to show appreciation for the good luck that they have received. The Christian origin belief is that knocking on wood (the wood of the crucifix) is like asking for protection (from Jesus Christ). The Jewish origin belief arises during the times that the Jews were being run out and killed during the Spanish Inquisition. Synagogues and Temples were built out of wood. Jewish people would have secret knocks on these Synagogues and Temples in order for the doors to open, and therefore, have their lives saved. Although we have these many origins, we still cannot say which one is true over which. In fact, the first documented use of "knock on wood" happened only about 100 years ago. So it's hard to say: does "knock on wood"'s origin date back hundreds and hundreds of years ago? Or did this saying just come about? 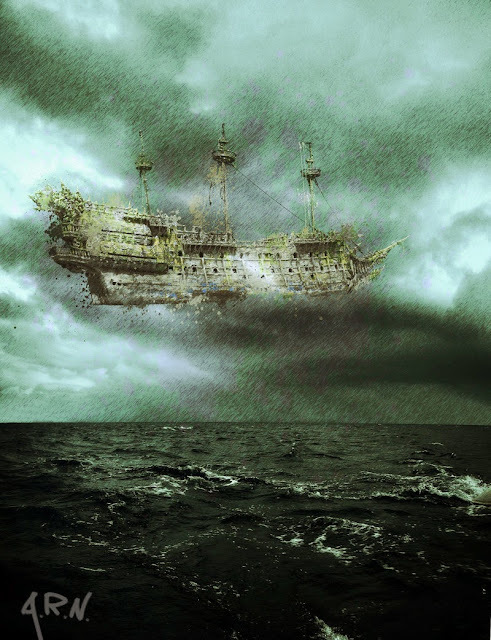 The Flying Dutchman is a legendary ghost ship that sailors believed was doomed to sail for all eternity, and served as an omen of the spectators' impending doom. First appearing in the 17th century, sightings would continue into the 20th century. Even England's King George V claimed to have seen the ship while on a voyage during his youth. While there are many stories of the ship, there is no evidence of it's existence. Those who saw the Dutchman claimed that it wasn't sailing, but flying above the ocean. The most widely accepted explanation for Flying Dutchman sightings is a phenomenon known as a Fata Morgana. A Fata Morgana is where a superior image (essentially a warped reflection) of an object in the distance is reflected on the horizon above it, resulting in a distorted, ghostly, floating image. It is believed this occurrence is what sailors saw, mistook it for a flying ghost ship, and the myth of the Flying Dutchman was born. Our eyes have been said to be "windows into our souls"; Hungarian physician, Dr. Ignatz Perczely believed that an individual's iris could not only look into their soul, but also that the iris "...maps to the rest of the body in some way, and therefore the flecks of color in the iris reflect the state of health of the various body parts" (1). When Dr. Peczely was a young boy, he found an owl with a broken leg. At this time, Dr. Peczely also noticed that the owl had a prominent black stripe in the iris of one eye; after nursing the owl back to health, the black line was gone and ragged white lines had taken its place (1). Dr. Ignatz studied at the Viena Medical College in 1867, where he was able to observe hundreds of patients' irides before and after surgeries (2); he went on to publish his research in his book, Discoveries in the Realms of Nature and Art of Healing and established his "Iris Chart" in 1880 (2), as seen below. 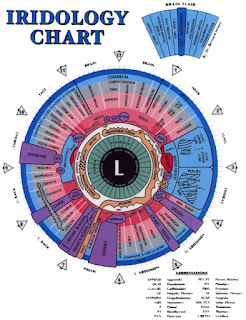 The basic approach to iridology stems from a treatment known as the homunculus approach, which explains that one part of the human body maps to the rest of the body (2). 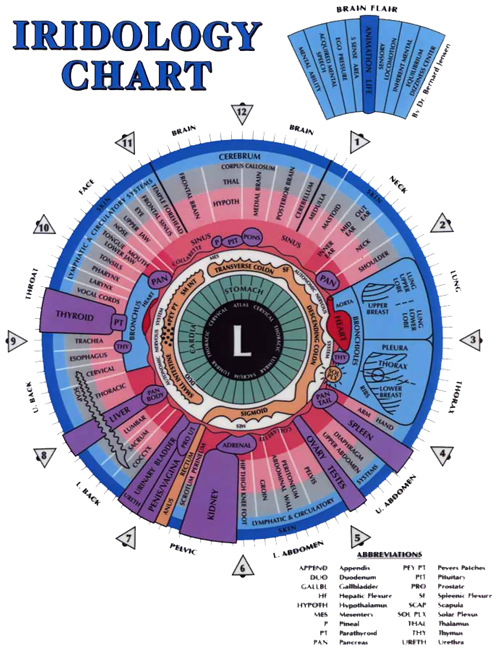 The problem with Dr. Ignatz's "Iris Chart" was that he invented the maps as a product of his imagination and the result of confirmation bias, not from actually scientific research. There were no blinded experiments or studies used to prove his theory. Sadly, iridology has survived and specifically in the U.S. can be traced to chiropractor, Bernard Jensen, who published the book, The Science and Practice of Iridology in 1952 (2); in the U.S., you can get a diagnosis from a naturopath Frank Navratil for only $150 (2). However, these "readings" are only medically cold readings, the iridologist will ask the patient about certain health issues, and if present in any form the theory is validated, but actual research has proven iridology has no effect and provides no useful information. Arthritis pain is something that many people believe to be true. 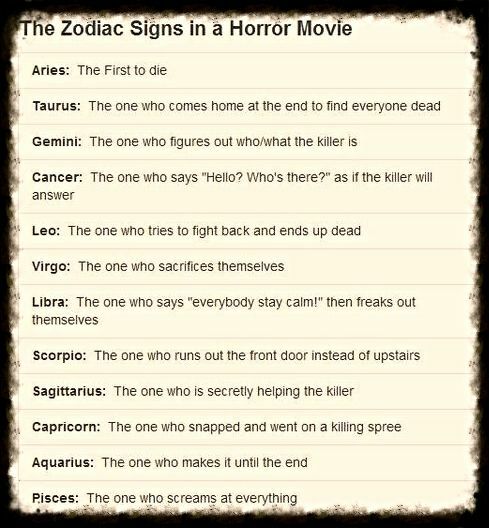 I can say without a doubt that I have experienced it. "Arthritis is known as an inflammation of the joint which is also distinguished by swelling, warmth, and redness. "However, I do not agree with the background logic concerning it. There is no medical study that shows weather affects the severity of the pain. Personally, my hands are always swollen and in pain, no matter what the weather, validating that the weather argument cannot be true. Many people hear things and agree with them, so hearing that weather causes pain to increase would correspond to them believing that is the source of their pain. Redelmeier and Tversky’s experiment proved that there was no pain correlating with weather, as there was a large gap between the two variables. Arthritis is something that is still trying to find its way through the medical field. As of today there are things like arthritis gloves that people wear to bed, but there is no proof to actually state whether or not it helps. 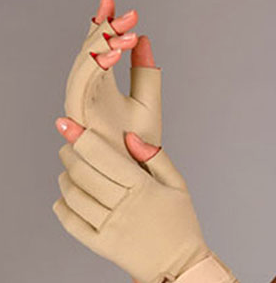 People that have used these gloves claim that they help to restore mobility in the fingers, as well as ease the discomfort. The arthritis gloves work based on heat, yet many complain that was the original cause of the arthritis. This would mean that the gloves are not working, but merely tricking people into using them for their own profit. there is no medical basis for how these would work and are therefore, a scam. Since 1935, several people have made claims that they have invented a water-fueled car. The invention of such a thing is certainly appealing due to the many concerns people have about using gasoline powered cars. Those who made these claims usually explained the process of removing the hydrogen from water to create the energy that would fuel the car. Some collected money from investors to begin building models of these water powered cars, but the vehicles would never reach the market, leaving the companies and inventors charged with fraud. These cars have received attention in the media repeatedly in the hopes that someone will be able to present a valid case for a car that will successfully run on water. However, the idea that water can effectively power a car is full of faults. In order to use the hydrogen in water to power a vehicle, energy would be lost. 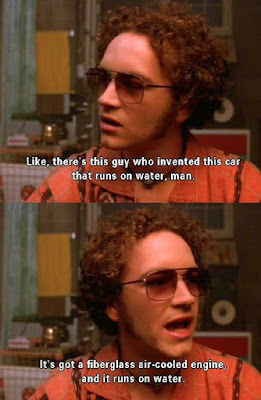 Critics state that a car that runs on water does not work with the second law of thermodynamics. As of today, claims of a water fulled car are purely shams. People are looking to gain fame or money by presenting a revolutionary idea such as this one.While water powered cars would be fascinating invention, they are a fantasy. 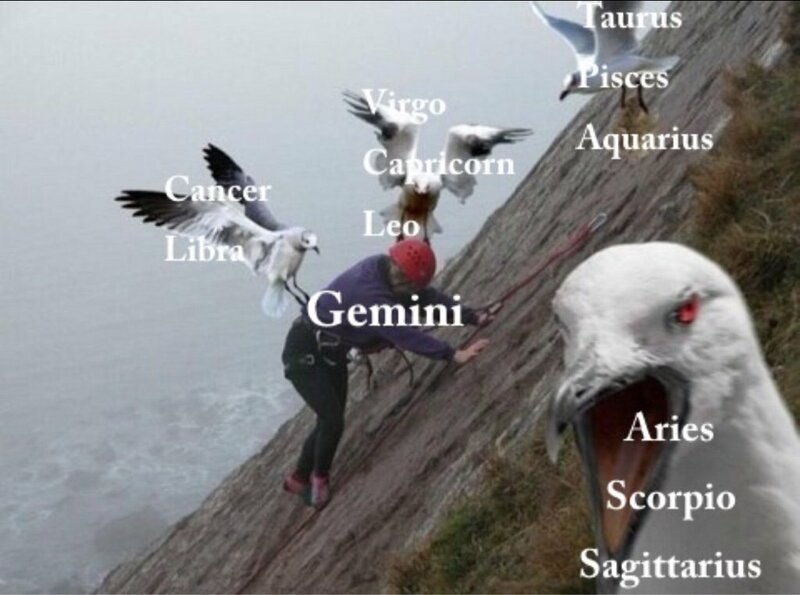 A horoscope is an astrological chart or diagram representing the positions of the Sun, Moon, planets, astrological aspects, and sensitive angles at the time of an event, such as the moment of a person's birth. The word horoscope is derived from Greek words hõra and scopos meaning "time" "observer" Other commonly used names for the horoscope in English include "Natal Chart" astrological chart, astro-chart, celestial map, sky-map, star-chart,cosmogram, vitasphere, radical chart, radix, chart wheel, or simply chart. It is used as a method of divination regarding events relating to the point in time it represents, and it forms the basis of the horoscopic traditions of astrology. In common usage, horoscope often refers to an astrologer's interpretation, usually based on a system of solar Sun sign astrology; based strictly on the position of the Sun at the Time of Birth, or on the calendar significance of an event, as in Chinese astrology. In particular, many newspapers and magazines carry predictive columns based on celestial influences in relation to the zodiacal placement of the Sun on the Month of birth, Cusp (2 days before or after any particular sign, an overlap), or decante (the month divided into 3 ten day periods) of the person month of birth, identifying the individual's Sun sign or "star sign" based on the tropical zodiac. No scientific studies have shown support for the accuracy of horoscopes, and the methods used to make interpretations are generally considered pseudo-scientific. In modern scientific framework no known interaction exists that could be responsible for the transmission of the alleged influence between a person and the position of stars in the sky at the moment of birth. Besides, all tests done so far, keeping strict methods to include a control group and proper blinding between experimenters and subjects have shown no effect beyond pure chance. Further, some psychological tests have shown that it is possible to construct personality descriptions and foretelling generic enough to satisfy most members of a large audience simultaneously. This is usually referred to as the Forer or Barnum effect. Slim Ring, made by a company in Japan, are one size fits all silicone rings that go around your big toes that make you lose weight. This product costs at least $35 but may cost a lot more. The "science" behind this product is that the bump your big toe presses down on changes your stride. Changing your stride changes the muscles that work when you walk and according to the makers, this change in muscle usage is what causes the slimming of the belly and thighs. This product isn't guaranteed to cause weight loss. 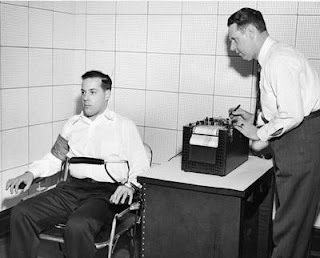 Polygraph tests, more commonly known as lie detector tests, have been placed in a category of pseudoscience although some still think they have a scientific basis. In 1988, the US government passed the Employee Polygraph Protection Act, which banned the use of the polygraph testing for pre-employment purposes. The test consists of two main parts; the subject is first asked a few "control questions" followed by questions that have to do with the purpose of the test. The control questions are set in place to create emotional discomfort. The biggest issue with these tests are how they are measured. The test has a physiological recorder that measures blood pressure/heart rate, respiration and skin conductivity. The use of these measurements makes an invalid assumption that there is a standard correlation between the physiological changes and deception. A nervous person may be innocent but afraid to answer the questions while a guilty person could be non-anxious. Another issue with lie detector tests stems from how the amount of physiological change leads to deception. Does it have to be an overwhelming difference or a slight difference? Polygraph tests have been proven to get guilty people to confess but there is a 50:50 chance that is will falsely identify an honest person as guilty. A new diet trend is detoxing/cleansing your body. This means that you either fast, drink only liquids, or stick to a specific diet of vegetables and fruit. They're short-term diets, it's impossible to use one for more than a short period without extreme adverse effects. The diets can cause you to lose weight, but majority of that is water-weight, and once a normal diet begins again, the weight will be gained back. The purpose of this is to flush out toxins. 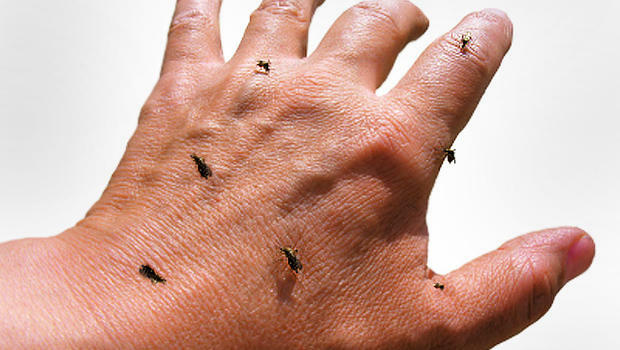 However, the human body is an expert at keeping itself toxin-free without the need of cleansing. There is currently no proof that the diets cleanse. Overall, keeping a healthy diet with exercise is the best way to lose weight and stay healthy. However, there are many healthy diets as an alternative to cleansing. After trying all sorts of treatments such as relaxation techniques, medications, and therapy, and seeing no results, people will resort to some strange remedies. 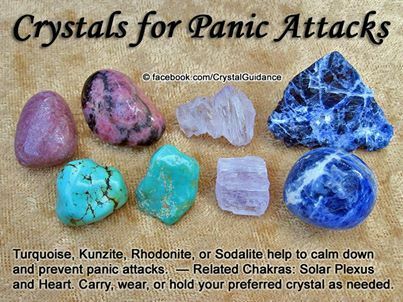 When you suffer from disorders like anxiety and panic attacks, and you overhear someone claim that, "crystals are safe, free of side-effects, and it works," you may just agree to try it if you're desperate enough. Cited from their website, "A Citrine Tumblie works to reduce anxiety, fear & depression, and it's nicknamed, "The Happy Stone”. A crystal known as Aventurine, works to establish a calm yet healthy & vital state of mind, keeping you free of fear & anxiety. Next, an Orange Calcite is known for it's confidence boosting energies, driving anxiety far far away. Lastly, dried organic crushed basil leaves reduce anxiety & are uplifting and balance emotions." To other people who understand that these amazing things are completely far-fetched and just aren't physically possible, we work to encourage people not to fall for these deceiving tricks. As an educated individual, I truly feel sorry for the people who resort to this type of treatment because I know that they're desperate for a cure and they are so easily influenced by people who are only out to make a quick buck, without any empathy for the people they trick. In recent studies, it has been proven that this is completely a placebo effect. There has been no difference in the results from subjects who were given the actual "healing crystals" and the subjects who were told that they were using the real ones but were actually given fakes. Both groups felt the same benefits and healing sensations from each test, which is just another reason as to why this theory needs to be abolished. Too many desperate individuals are sacrificing their sanity and wasting their money on something that doesn't work and benefiting tricksters who deserve to be punished for their lack of empathy and history of deceiving acts. ""I consider myself to be a water connoisseur; I've tried all bottled waters and Aquamantra is by far is the best tasting water available. It tastes so clean and refreshing, it feels alive and full of vitality. I've been drinking I AM LOVED for a year now and it not only tastes wonderful, it has completely stabilized my body's alkalinity. My body's PH level was very acidic and after drinking Aquamantra, I maintain a perfect PH balance. I truly believe I AM LOVED is LOVING my body. In addition, my energy has skyrocketed and my skin glows!" - Jennifer Mattox, Passion for Paws"
The implications of AQUAMANTRA water are glaringly obvious. If we could all benefit from drinking water that was labeled to improve the quality of our lives, why not stick Post-It Notes labeled, I AM RICH or I AM INVINCIBLE on Aquafina? Used by psychic readers for centuries, the crystal ball is one of the most recognizable items in the world of fortune telling. It was first used by Celtic tribes in the same way it is used today- to see into the past, present, and future of a clients life. Psychics, high priests and priestesses, gypsies, and other supposed mystics believe in the many powers of crystal balls in the process called "scrying". They were originally made of beryllium but are now more commonly made of quartz, both of which are clear, reflective gemstones. Several unproven claims about the usage of crystal balls exist such as, clearing the mind of the psychic, assisting in entering trance-like states, and strengthening their powers of clairvoyance. All of these claims are almost impossible to prove because they depend on the belief of psychic abilities to begin with. A psychic medium may claim any of these effects and uses for crystal balls, but anyone without supposed psychic powers would be unable to witness these effects. Until then, people who are believers will continue paying for the services of psychics and crystal balls. Alternative medicine is any practice that is put forward as having the healing effects of medicine, but is contradicted by established science. Though there is research that shows alternative medicine techniques can help with problems like pain and nausea, there isn't enough medical evidence to determine if they are effective. Alternative medicine is well and good if you're trying to cure a headache, but it becomes incredibly dangerous when it comes to major illness and disease. "I have cancer so I'll go on a juice diet and do yoga, and my cancer will go away- who needs doctors". There's no evidence to prove alternative medicine actually helps cure major illness, in fact there's far more evidence stating that alternative medicine is useless and dangerous. So why do people risk their lives to pick alternative medicine over doctors? People just like the sound of "drink this juice and get better" over "you're going to need surgeries and radiation therapy, and you're gonna hate it but hey you'll have a good shot at living", alternative medicine is incredibly enticing because it looks like the better option by far. However, things that look too good to be true usually are just that. So pro tip: If you get some crazy disease, see a doctor you hipster. Headaches are fair game though, whatever floats your boat. This popular fad became famous in 1975 when it was invented by New York inventors Josh Reynolds and Maris Ambats. These mood rings are sold for the purpose and promise of being able to change color to the color of the mood the wearer is in. For example, if the wearer's ring were to turn black, the color code says that the wearer is supposedly stressed. There are hundreds of color codes for these mood rings. In actuality, the ring is a "specialized liquid crystal thermometer". Changes in body temperature is detected by the thermometer, thus causing a change in color in the stone. Therefore, the ring has nothing to do with guessing your mood. Body temperature and moods have no relation with each other. The fad is still popular today, mainly with young children. The Ouija board began as a novelty game which could magically identify answers to questions by using a planchette which seemingly moved on its own. The board appeared to suddenly appear into game culture, but in reality a prototype was previously used by individuals attempting seances or communicate with spirits. Some psychologists believe there to be a link between the known and unknown through the board. Once Hollywood began using the board in movies, they became a taboo overnight. In reality, the movement of the planchette is determined by the users' slight unconscious movement of their fingers. Powerful messages from the Ouija board on impressionable people leads to extreme belief in the power of the board. Psychics, mediums, and everyday believers continue to use these boards and feel that they do in fact contact the dead.